Founded in 2002, Five Below is one of the leading retailers of trend-right, extreme-value merchandise—priced from $1 to $5—to the teen and pre-teen market. The company first came onto Advent International’s radar in 2004 as we were exploring opportunities to build on our discount retail experience with Poundland in the UK and Dollar Express (now part of Dollar Tree) in the US. Six years later, Five Below began exploring interest among external investors and approached Advent because of our capabilities in retail, particularly in this sub-sector. In October 2010, we acquired a 65% stake in an all-equity transaction. From Advent’s perspective, Five Below had a talented management team and an attractive business model. “Given our experience with Poundland and Dollar Express—which occupied similar places in the market—we believed that Five Below’s strategy and approach would be well received in the retail marketplace,” notes Advent managing director Steven Collins. At the time of our acquisition, consumer sentiment remained soft and there were still questions about how soon the retail sector would rebound. 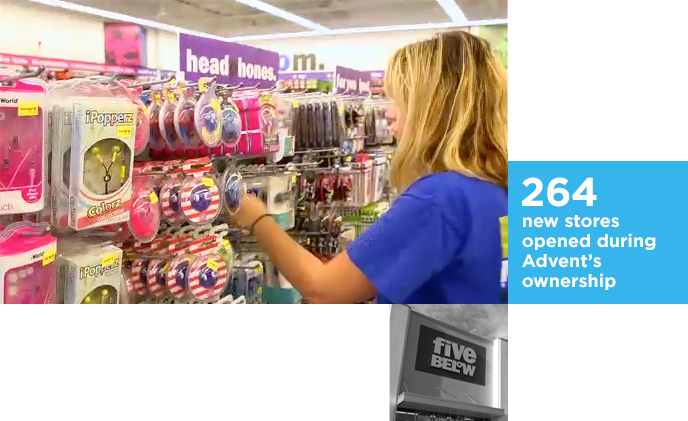 Yet in Five Below, we saw a niche-market concept with a focus on shoppers age 12 and above. Our analysis showed a potential not just for growth, but for significant expansion. Prior to our investment, the company had reported positive same-store sales growth for 17 consecutive quarters, even as it was expanding. The next step was to accelerate that growth. We had come to know Five Below’s co-founders as visionary retail leaders who had plans for a much larger business. But they needed support to build a world-class top management team and expand the employee pool. Our role included helping recruit a new COO, a senior VP of marketing and VPs of human resources and finance, and bringing on retail industry veteran Tom Ryan, former CEO of CVS Caremark, as a board member. Five Below went on to hire more than 1,800 new employees over the next two years. Together with the leadership team, we created an infrastructure growth plan based on a refined real estate selection process and analysis of unit potential. This plan also called for implementation of new warehouse and IT systems and increased distribution center capacity. We also helped to install best-in-class financial reporting systems and to optimize the capital structure. These improvements enabled Five Below to grow its store network and sales even faster. We helped the company go public in July 2012, selling a portion of our shares in the offering. We then sold additional shares through secondary offerings in 2013 before completing our exit in April 2014. During our ownership, Five Below more than tripled its store network from 102 in fiscal 2009 to 366 in fiscal 2014, which ended Jan. 31, 2015. It also enlarged its footprint across 19 states in the Northeast, Mid-Atlantic, Southeast and Midwest regions of the US. Over the same period, net revenue increased 5.4 times from $125 million to $680 million, while EBITDA grew nearly ninefold from $11 million to $95 million.